Car and Driver have seemingly broken Saab’s embargo. These images are now out there, so I’m bringing them here to Saabs United. Of course, these are just the first two images and they’re CGI images, at that. The real thing will be seen later today at the Geneva Motor Show and I’m sure there will be more words, as well as many more photos. As mentioned earlier, this will be seen as a controversial design. That’s the way all new designs should be. Jeff P did a good job of summarising some points from the C&D article. All LED lighting, with Red instead of green inside which is supposed to remind people of the beating heart. I like it for the concept, I’m not sure if that’s intended for production. Comments are open, but remember, the real thing will be showing, and will be photographed from all angles later today. My 2 cents – I have to have a better look, but my first impression from scanning these images is that I love 98% of it. Absolutely love. I’m not so sure about the flourishes at the top of the door, nor the Mantide touches around the back. Neither of these offend me at all, but they’re the two bits that I need to see for myself. The teardrop effect of the glass is mesmerising. The overall shape is aggressive and even automotively suggestive. It looks like it wants to be driven. Perfect. Just a quick note – no red interior lighting on production cars, please. I understand the beating heart analogy, but if you cut a Saab, you’ll see that it bleeds green. Is it OK for me to start this off with a mini-rant? It’s my site – of course it is! What the heck is a design-focused website doing when it’s got an entire screen width at its disposal, yet chooses to actually publish its articles in a column about 180 pixels wide, and in a teeny tiny font? Design’s supposed to be functional, yes? Anyway, the so-hip-I-don’t-get-it website called Wallpaper* spoke briefly with Jason Castriota, Saab’s head of design. What’s your design vision for Saab? I’m after that ‘jet on the road aesthetic’. I want to recuperate Saab’s aeronautical roots including that double teardrop shape from its fantastic history that has been diluted in recent years. But it will be done with a thoroughly modern take. Saab has good rivals so we need to do something very distinctive. So what can we expect from Saab next? At the LA show this year you’ll see the production 9-4X based on the 2008 concept, followed by the 9-5 wagon in 2011 plus a new concept from me in the same year before the production 9-3 arrives in 2012. It’s a tight timeline to get that 9-3 right! Afterwards my next homework assignment is a new small Saab. A word about that schedule, if I may. There will be a very strong temptation for people to see this concept car early next year and take it as being a conceptual version of the new smaller Saab (referred to often as 92). My understanding is that this isn’t the case at all. 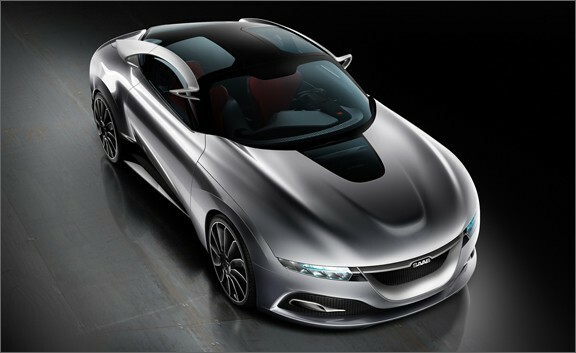 The concept car that Saab Design is working on (to be shown at Geneva 2011) is pure concept. A design statement. It’ll be the bookend to the Aero X concept from 2006. Elements from this car will be used on Saabs that follow, but there won’t be a Saab that follows that looks just like this concept car. There’s been a fair bit of interest – and some mixed feeling – about the Saab-based cars that Beijing Automotive (BAIC) will be showing at the Beijing Auto Show, starting this Friday. Here are the two cars once again…. I’ve had a few emails come in from people in the region. I’m pleased to let you all know that a local named Simo will be heading off the Beijing Auto Show and will send along some photos of the cars displayed on the stands. It’ll be great to hear his thoughts and get the images online. Also, Kenny T has written in with a few bits and pieces about them as well. Firstly, the word going around several Chinese forums (forii?) is that these vehicles have been built in Trollhattan as show specials. I know a few of you have speculated about this in comments and it seems you might be right. It makes sense, too, that these would be purpose built show cars. All other manufacturers do it, and BAIC most likely don’t have the machinery they’ve acquired set up and ready to produce vehicles yet. Secondly, Kenny has sent along a picture of the interior of the C60, which looks like it’s directly out of a 2007+ Saab 9-3. I don’t have a reference for the site where the image originates but you can see the different badge on the steering wheel. Again, this would tend to confirm to me that it’s a Trolhattan built car. I’m sure the Chinese would modify the interior to some extent. it does raise some questions as to which version of the 9-3 they might have bought, though. All indications that have come to me from Saab were that they bought pre-2006 Saab 9-3 ‘tooling’. Exactly what they mean by ‘tooling’ I’m not sure, but I’ve always assumed it’s the specialised machinery involved and the right to use any intellectual property in terms of design and engineering, etc. The appearance of a 2007+ interior does muddy the waters a little on that count, but I don’t think it necessarily changes things. If these are what they seem – show cars built in Trollhattan, essentially concept cars – then it would make perfect sense that an existing interior would be installed given the time constraints involved in putting these cars together. Regardless, it’s very interesting to see what BAIC have done with Saab’s work and I look forward to watching these evolve and make their way to market in the future. New images available over at BitAuto. Thanks Kenny! Like it or lump it. Compact concepts are the flavour of the month around here right now. A little while ago, I showed you the front of a concept drawn up by the guys at Auto Motor and Sport. Many of you thought it a bit too Fiat 500 for your liking, though I thought it was actually OK at the front. Today, we have the addition of a rear quarter photo as well and it’s at this point that I jump the fence and say ‘no thanks’. As I see more of this sort of thing, I’m starting to form an opinion on this whole teardrop shape idea, and unfortunately I don’t think it’s a positive opinion. I like the idea from a conceptual point of view, but I’m yet to see an execution that makes me think it can win over a whole bunch of people looking for a modern compact car. I always thought that Carl-Peter Forster was a pretty straight shooting guy. His GM blog, Driving Conversations, always had a much more down to earth feel than the others. Less spin and more meat. And he was the guy ultimately responsible for Saab in the end, being the head of GM Europe and the Chair of the Saab board. Though I get the feeling that that responsibility meant that he answered for their results but took orders as to their future. Anyway, CPF has quite possibly confirmed my stand-up-guy thoughts. There’s rumours around through papers in Germany that he’s resigned from GM Europe due to their failure to complete the Opel deal. Autoblog report that he was ‘disgusted’ with the way the process was handled by GM. Welcome to the other side, CPF. Inside Line are reporting that Saab is to build a new concept car in the next 12 months, one that will reportedly state Saab’s future direction in a post-GM world. My brief message to Saab – unless you’re getting interns in to do this, please don’t. You’ve got a minimal staff and everyone’s needed to make real cars you can sell. Give us a present we can believe in and then work on the future. More talk in the Chinese automotive media about Beijing Automotive building the old Saab as their own badged vehicle. Our customers can also look forward to the new 9-4x, with which we will present ourselves in segment of the crossover cars. Of course the new 9-3 is first priority but we will also keep an eye on the segment below the 9-3. You, our customers will see a even more consequent alignment of Saab for we return to our roots – this is where we belong, this is where we want to be. And those who couldn’t find the right Saab in the past can choose from a much broader product range now. The Saab brand was never more important than it is today. Our consequent alignment on the aspects safety and environment will be our trademark in the future. Saab stands for independent thinking – and we invite you to learn more about our way of looking at things and to become a part of the future of Saab. Big day today. Matress shopping, BBQ shopping and then watching/helping a mate who’s putting a supercharger into a Corvette!! Does anyone know the whereabouts of the Mayo P1? This is another custom built car based on Saab mechanicals by a guy named Leif Mellberg. We’ve covered a couple of Mellberg’s custom Saabs in the past, though this one may be the most distinctive yet. This car is called the Mayo P1 and it was built in the early 1990s using a lot of parts from the Saab 9000. Mellberg built it based on designs by Sune Envall, the brother of legendary Saab designer, Bjorn Envall. Mellberg envisioned a run of 20 of these vehicles, but only one was ever made, mostly due to economic conditions at the time. The car cost around 1.5million SEK and that’s in 1991 money! Wheels: 16 “Aero wheels, Bridgestone tires, 245/40-16. I hadn’t heard of this car prior to receiving an email from one of the writers from Tekniken’s Varld today. Well, I though I hadn’t heard of it, but when I did a search I found that a reference had been made to it in comments here, in a prior post. That comment contained the link from which I obtained the information you’re seeing now. I got the impression that the guys at Tekniken’s would like track the car down. Actually, these photos look like magazine scans and I wouldn’t be surprised if they’re originally from Teknikens Varld. If you’ve got any idea as to where the car might be today, please feel free to drop some knowledge either via comments or email. It really would be great to track these unique ‘Saabs’ down. There is some talk that Mellberg may have had a hand in the Saab EV-1 concept car, too, though I’d not heard that before. These images of a proposed Saab concept vehicle are from a Spanish design student named Rubén Barrientos. Note: they are not Saab images nor do they come from Saab design. They are a student’s design project only. But they’re interesting. When I first saw that rather noticeable front end, my immediate reaction was ‘arrghhhh!’ But having spent a little more time with it this morning, and having read what it’s meant to symbolise, I’m coming around to it. I’m not so sure I’d like to see it in production, but it is the type of quantum leap from current design that could be justified given Saab’s impending new circumstances. i.e. – change of owner, change of design language. Here are some of the images. There’s a whole bunch more at Car Body Design. OK, to the front of the vehicle. If I’m reading the designer’s notes correctly, those lights and the shape of the front ‘grille’ is supposed to mirror the face of an eagle/gryphon. The lights are eyes and the inverted angular bits are kind of like how a beak would look, front on. Look at it long enough and you’ll see it. At the back, there’s a shallow tribute to the way UrSaab angled down to a point at the rear of the vehicle. I’m not so much a fan of the single exhaust that forms that point on this model, but I can see what he’s trying to do. I this panel, you can see how he’s pointed a note towards Saab’s avaition background with the point behind the rear doors mimicking the tail fin of an aircraft. I think those rear doors are rear-hinged, a-la the Mazda RX-8, to allow easy pillarless access to the rear seat. If had one criticism of the design over all, it’s that I prefer softer edges to the hard ones used here, and that goes especially for the interior concept. And why we’d want a massive shifter like that for the transmission, I’ll never know. Over all, I like this a lot more than my initial reactions indicated I would. It’s pretty bold, that’s for sure, and I wonder if it’s maybe a little too ‘loud’ for a company like Saab. Then again, the Aero-X wsn’t exactly a shrinking violet and even the Saab 900 looked like little else at the time. Kudos to Mr Barrientos for a well executed bit of work. In my opinion, at least.